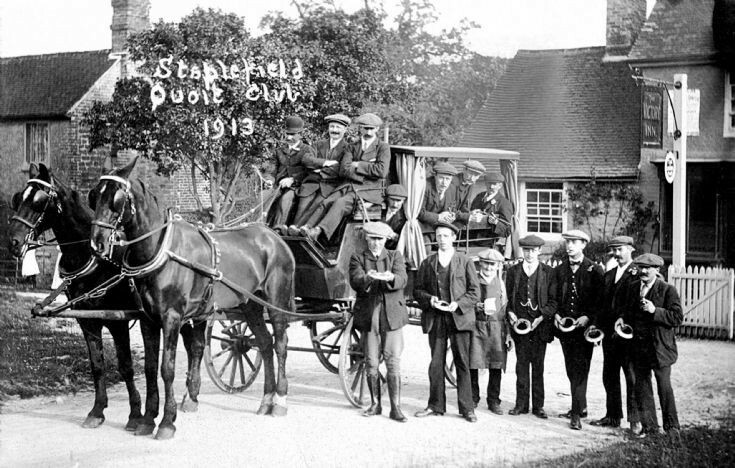 The Staplefield quoits club members proudly show off their quoits outside The Victory. The short fellow with the jug must be the landlord, but I am not sure if the minibus can accommodate all the remaining thirteen to their away fixture. I am wondering if, indeed, the horse-drawn carriage has brought the away team from another pub. The Large Version shows a close-up of the men all wearing some form of headwear. I can identify two of the passengers inside the cart. On the left is Frank Matthews who lived at Upper Common, and in the centre my grandad, Walt Chinnery, from Somerton Cottages, Staplefield. I was asked by Barry Ray if I could identify any members of the quoits team. This is a great site showing the modern history of my home village which I still love.